It’s a new year and I’ve already been so busy, running around, planning, baking, cooking – the list is endless. In all the chaos I sometimes forget to, or rather I’m too busy to, cook a complicated meal. Cooking can be long and arduous, but it doesn’t have to be. I definitely believe in no fuss meals and today I wanted to bring you something extremely simple but absolutely delicious. 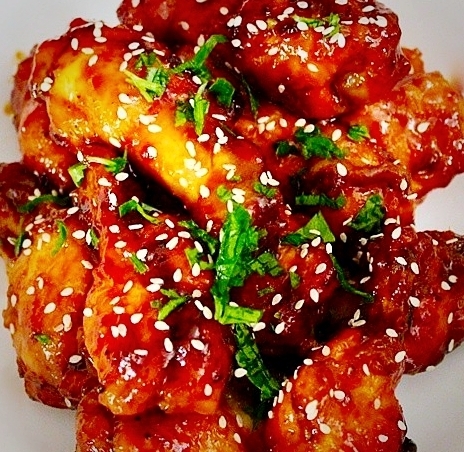 Perfect for a snack or for a quick lunch or dinner, this sweet chilli chicken is sure to impress. You can make it with chicken legs, thighs or wings; and eat them with nearly anything under the sun. 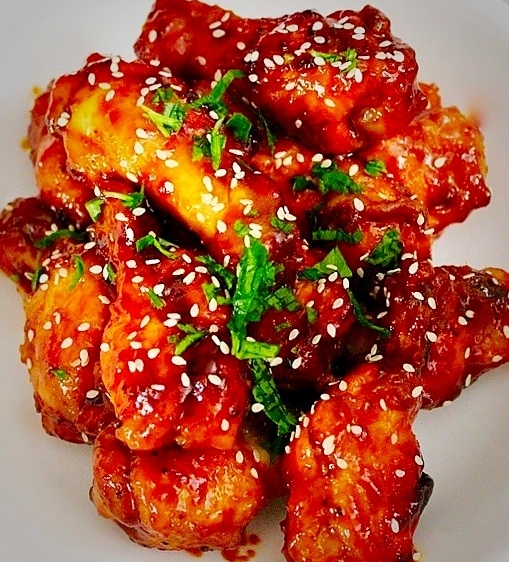 Make the glaze by mixing together the chilli sauce, honey, sesame seeds and oil in a large bowl. Using a knife make 3-4 slits across the skin of each chicken piece. Season with salt and pepper then lift the skin of each wing and tuck the crushed garlic underneath. Now dip the chicken pieces in the glaze until they are evenly coated. Reserve the rest of the glaze for later. To cook the chicken, preheat olive oil in a wok or a pan, put the chicken in the pan and fry for 8 minutes or until golden and sticky. Turn the chicken breasts over, cook for another 6-8 minutes pour the remaining glaze over the chicken and fry together until chicken is cooked through. Serve straight away with wedges of lemon for squeezing over, if you like. You can grill the chicken for a healthier alternative. Enjoy them on their own, with plain rice or even potato wedges. These are perfect to serve at parties or BBQ’s as well and are guaranteed to leave your guests wanting more. Kanta I need to hire you to teach my new wife how to cook . All she knows is nshima and kapenta. Please let’s have ifi-mbombo on your blog next week. I love to wash the stuff down with a chilled lager down the pub.